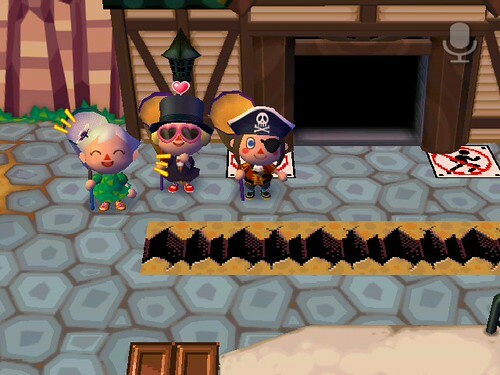 Things seemed normal enough when I walked into the Able Shop. I bought a snorkel, talked to Sable about Saturdays. Then I walked to Mabel, just to make sure. And she wasn’t happy! Now I have to choose “Is it a sibling?” or “Might it be…” I’ll go with the sibling one, I guess. Huh…! Why, Squirt! How did you know that?! …Oh, I know. 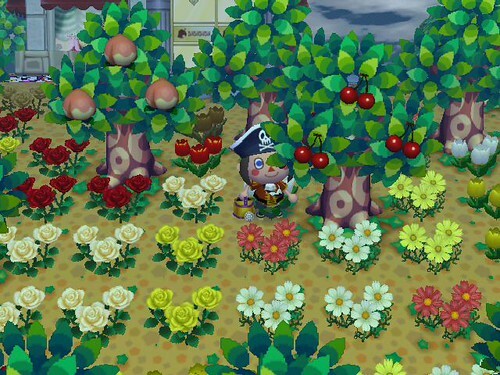 It must have been Tom Nook… I can’t think of any other way you would have known. Well… You’re right, for what it’s worth. Between me and my older sister Sable, I have another sister. Her name is Label. Because of various circumstances, we live apart now. 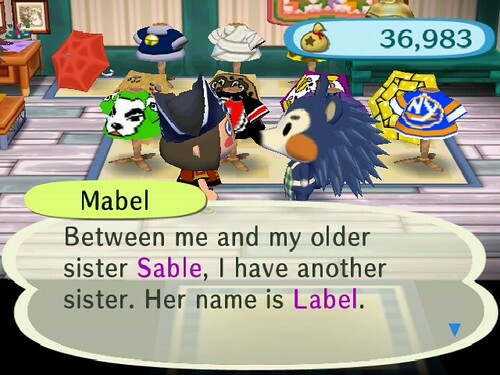 Mabel, Sable and Label. Cute names. Again, I have a choice. “Why is that?” or “Where is she?” Since I already know she’s at GracieGrace, I’ll go with the first one. 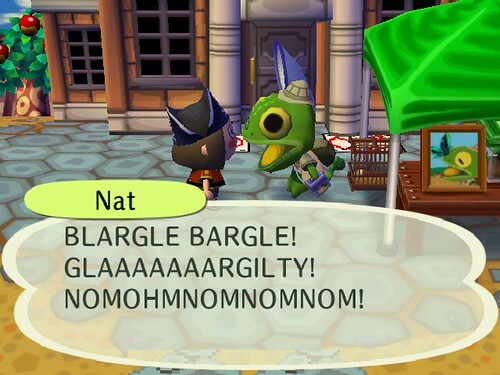 …Ohh, Squirt! You’re like a police detective or something! Don’t worry about silly little details like those! Now, I need to get back to work! And then Mabel refused to talk about the subject any more. But, does this mean the controversy is over? I mean, I have the proof now, but do I still have to worry about this family drama and help fix it? I dunno. Ugh, there are a TON of wilted flowers today. Where’s the rain? It’s all dark and cloudy but no rain! Ooh the rain started. YAY! No more watering. It's Pal, someone who's name escapes me, and Squirt!